You're Invited! We're looking for a diverse group of staff/teachers, students, parents, and community members to participate in a weekend-long workshop to have an active voice in re-imagining Mohawk's pathways to graduation. This opportunity is possible through mini-grant funding by Mass IDEAS, an initiative of Next Generational Learning Challenges at EDUCAUSE, with generous support from the Barr Foundation and the Nellie Mae Education Foundation. 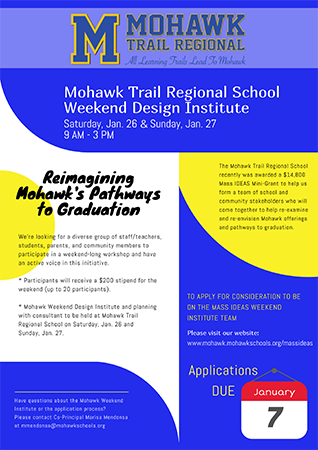 The Mohawk Weekend Design Institute provides our community stakeholders with an opportunity to participate in reviewing and re-imagining Mohawk’s graduation requirements. The two-day workshop will be on Saturday, January 26 and Sunday, January 27 from 9:00 a.m. to 3:00 p.m. Interested? We are now accepting applications! The Mohawk Mass IDEAS Design Team will review applications and select 20 participants. We ask that staff/teachers, parents, and community members fill out an application. Students, please fill out our student application.